Only a 5 minutes walk away from the three impressive towers we welcome you in a cosy, peaceful and romantic surrounding. Easy accessible by public transports or by car. Parking Ramen P8 in front of the house (14 euro/day). You can also use parking P7 St Michiels (only a 5 minutes walk). A major part of the historical city of Ghent is car-free. 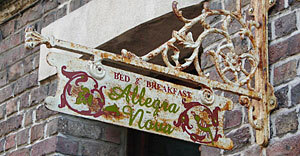 Allegra, Standard Studio, on the first floor, is decorated in modern Belgian style. The room consist of a sleeping area with bathroom, situated on the quiet backside. On the street side there is breakfast/living room with TV, desk, internet access and a practical own kitchen with refrigerator, microwave, coffee machine, utensils and kitchenware. Smoking is not allowed in the rooms and pets are not welcome. 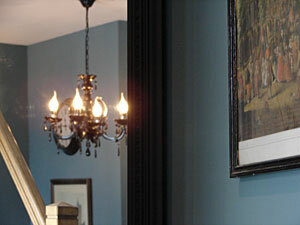 This studio is fully decorated and designed by Ghent artists. 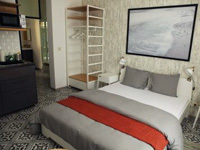 The studio consists of a sleeping area with double bed, a bathroom with shower, living room with sofa + cable tv & Wi-Fi. In addition, adjacent to a fully equipped kitchen with ceramic hob, extractor hood, refrigerator, freezer, microwave oven, espresso-machine, kettle, kitchen sink and accessories. There is a supermarket on the corner of our street. Very comfortable for 2 guests, but also possible to use by 3 or 4 persons by the presence of a sofa that can be transformed into a double bed (1,3m x 2m).